The Connecticut Principals’ Center of the Connecticut Association of Schools welcomes first and second-year elementary and secondary building administrators of CAS member schools at the principal or assistant principal level to attend the New Leaders Academy. The New Leaders Academy brings together experienced administrators with colleagues who are in the first two years of their administrative careers. The Academy sessions feature a topical presentation followed by cohorts of new administrators who will meet with an experienced facilitator to discuss problems of practice associated with the day’s topic. Academy participants will learn from each other as well as from the cohort facilitator. The sessions will be held from 8:00-11:30 a.m. to allow administrators to return to their schools. New school leaders are encouraged to register for this free program; and superintendents hiring new building administrators are urged to provide this valuable professional development opportunity to their new hires as part of their district’s orientation strategies. Registration for this program is available online for CAS member schools. 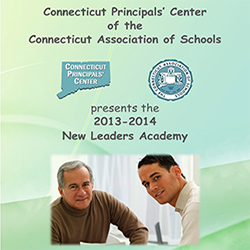 Please contact our CAS staff at 203-250-1111 if you have questions regarding the New Leaders Academy offerings.